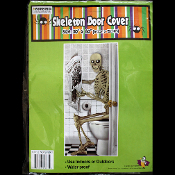 Hilarious bathroom door cover, featuring a skeleton reading The Hell Morning Post! Halloween Door Cover Skeleton Sitting on the pot, giving it all he’s got! Ghostly Door Cover Restroom Design is plastic, so can be wiped clean. Creepy skeleton also makes a weird gruesome refrigerator door cover, too . Use to create the scariest and funniest house on the block!